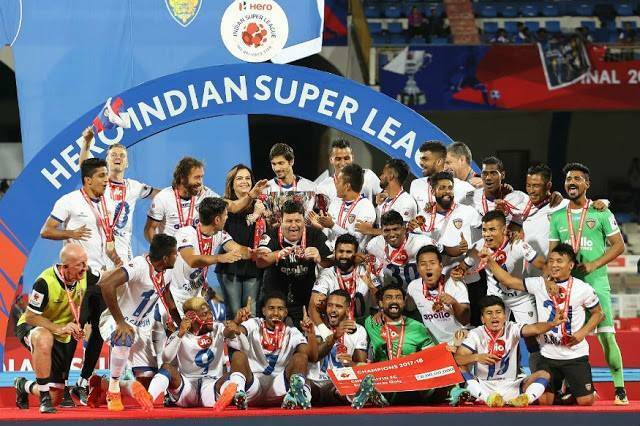 The odds were stacked against Chennaiyin FC, as they faced a marauding Bengaluru FC in their own fortress at Sree Kanteerava Stadium in the ISL final in a battle worthy of a summit clash for the ISL glory. Chennaiyin FC raided the fortress with brilliant attacking prowess as they handed a crushing 3-2 defeat to the Blues to end their 10 games unbeaten run to be crowned as the 2018 ISL Champions. Goals from Mailson Alves(17′,45′) and Raphael Augusto(67′) sent Bengaluru FC to an excruciating defeat in front of their raucous home support to hand Chennaiyin FC their second ISL glory on Saturday night with Mailson emerging as the hero for Chennaiyin FC with two thumping headed goals. For Chennaiyin FC it ended as often it does with the smiling and fist-thumping team photos amidst eruption of confetti as John Greggory’s side came from a goal down from Sunil Chhetri’s diving header on the 9th minute to vanquish a memorable 3-2 win. Bengaluru FC looked to stamp their dominance in their game as they came out all guns blazing in their 3-4-3 formation as the fullbacks overlapping from both sides kept Chennaiyin FC holed up in their own half in the first quarter of the game. Talismanic skipper Sunil Chhetri put Bengaluru FC ahead as his diving header from Udanata’s cross found the back of the net on 9th minute but the lead was shortlived as Mailson Alves’s towering header from Gregory Nelson’s corner to restore the parity at 1-1 on the 17th minute. The Blues were again found-out wanting to defend from the dead ball situation as Mailson scored his second header of the night rising above his marker John Johnson from Nelson’s corner to give Chennaiyin FC a crucial 2-1 lead going into the halftime with another thumping header leaving Gurpreet Singh no chance to save it from crashing to the back of the net. Back in the second half as Bengaluru FC came out attacking but Chennaiyin FC maintained a compact defensive formation and used Bengaluru’s high line of attack to score their third goal on 67th minute as Jeje found himself with space in the box and managed to hold off his markers to play it back to Raphael Augusto on the edge of the box.The Brazilian set himself up with a good first touch to unleash a spiffing right-footed curler past Gurpreet Singh to give Chennaiyin FC 3-1 lead in the summit clash in the 67th minute. With a 3-1 lead, Chennaiyin FC got the breathing space and played with composure as Bengaluru FC desperate for an inroad kept knocking the Chennaiyin FC defense. Sunil Chhetri once again came close to put Bengaluru FC back in the game on the 72nd minute as his header from Perez’s corner destined for the goal was saved by Karanjit Singh. John Johnson came close to scoring with a header from point-blank range as Miku’s cross found him right in front of the goal but Inigo Calderon’s crucial touch deflected the ball enough to prevent John Johnson from scoring. The best chance of the second half fell to Sunil Chhetri on the 86th minute as Miku powered himself into the box from the right and his cut-back found Sunil Chhetri with the wide open goal in front of him but Chhetri blazed his shot over the goal to sum-up a disastrous night for the Blues. Deep into the injury time, Miku managed to pull one back for Bengaluru to make it 3-2 on the 92nd minute from Udanta’s cross but it was the proverbial too little too late, as clocked ticked by and Chennaiyin FC was sent into a rapturous celebration with the referees’ final whistle to stamp a 3-2 win to be crowned as the winners of ISL 2018 Champions.